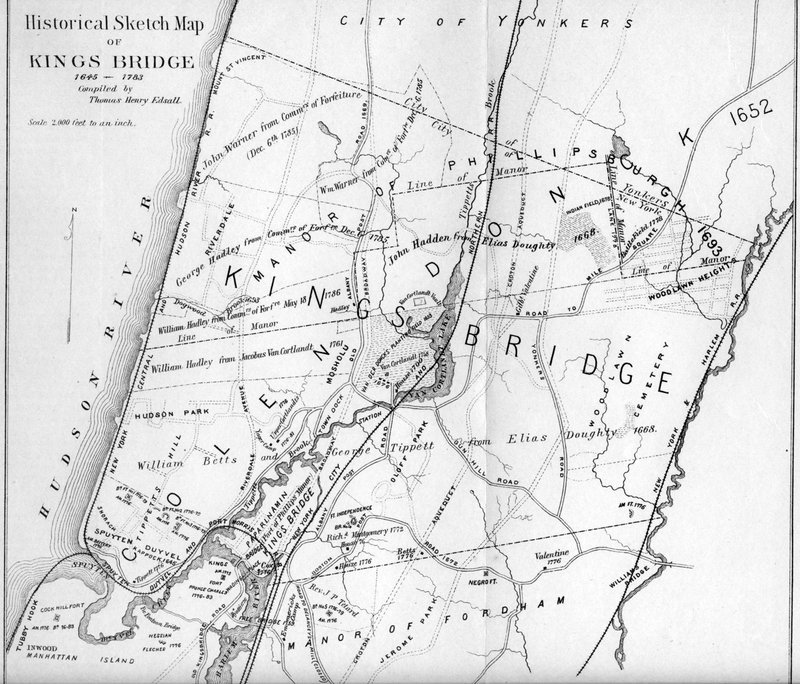 c. 1770: Sketch of the environs of King’s bridge. 1776: Sketch of the Heights of Kingsbridge, with the proposed redouts couloured yellow. 1776: [Map of defenses of New York Island from Fort Washington to Fort Independence, with redoubts, etc. planned between. 1776: Sketth [sic] of the Hessian attack on Fort Washington under General Knypehausen on the 16th November 1776.
c. 1776: [Unfinished draught for a topographical map of the northern part of New York Island. 1777: Sketch of the Heights of Kingsbridge 1777, with the proposed redoubts coloured orange. Old rebel works coloured black. c. 1777: [Part of modern Westchester County]. 1778: A plan of New York Island with the circumjacent coutry as far as Dobb’s Ferry to the north, and White-Plains the the east; including the rivers, islands & roads in that extent…1st September 1778 / John Montresor, chief engineer. c. 1778: [Positions of the British troops between the Hudson River and the Bronx River at Valentine’s Hill]. 1779: Sketch of the roads from Kings Bridge to the White Plains and parts ajacent shewing the encampment of his majestys forces under the command of Major General Mathew 1779 / by I. Hills. 1781: Reconnoissance de King’s bridge. I. 1781: A map of the country adjacent to Kingsbridge, surveyed by order of his excellency General Sir Henry Clinton K.B., commander in chief of his majesty’s forces &ca, &ca, &ca 1781 : Surveyed & drawn / by Andw. Skinner and George Taylor. 1799: New York to New Rochelle : from Christopher Colles’s survey of U.S. roads 1789. 1839: Map of the County of Westchester. (New York). 1872: Southern Part of Yonkers, and Portion of West Farms, Westchester County. 1895: Map of the 23rd & 24th wards of the City of New York, showing the new street system . . .also that portion of Westchester County annexed to the City of New York. 1900: Index map: Westchester Co.
1905: [Topographical map of the western part of the Bronx, north of Spuyten Duyvil] (Van Cortlandt Park). 1907: Index map: Yonkers atlas. 1909: New handy map of the borough of the Bronx. 1912: Map of Van Courtlandt Park, [Bronx] New York City, from a reconnaissance by Corp. Chas. L. Schuettler, Co. K, 22nd Regt., Corps of Engineers, N.G.N.Y. 1920: [View of the Kingsbridge section of the Bronx].